Movies • Actor promotes his films, especially his wife's movie, at the Venice Film Festival. Venice, Italy • Willem Dafoe says "A Woman," one of his latest projects, is the kind of "pure personal cinema" that he wants to keep on doing. 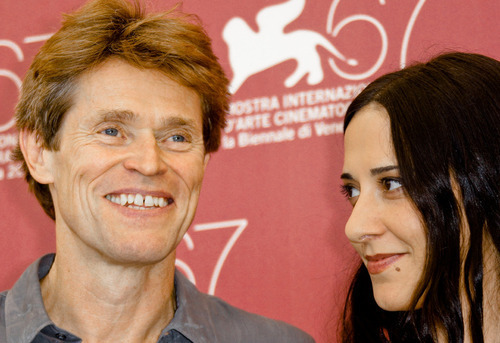 Dafoe plays a novelist devastated by his wife's death yet caught up in a new romance in the film by Italian director Giada Colagrande, his real-life wife. The film noir starts out in nighttime Manhattan, and only gets dark under the harsh light of Italy's southern Puglia region, where the sun and the sea play menacing roles. "It is quite pure personal cinema, and it is quite pure cinema, because it is an expression of what Giada wants it to be," Dafoe said in an interview this week at the Venice Film Festival, where the movie premiered in a section of Italian films. "What it is is quite unusual, and something I want to keep doing," he added. "A Woman" was one of two films in which Dafoe appeared in Venice. The 55-year-old actor also had a small part as Eddie, an American who witnesses the evolution of an orphanage for Palestinian children, in director Julian Schnabel's "Miral." But the film he is busy promoting at the Lido is his wife's. It's her third film, and their second project together after "Before It Had a Name," which he also co-wrote. All three of Colagrande's movies have premiered at Venice. There is something menacing in Dafoe's Max Oliver, as in many of his better-known roles, from Spider-Man's nemesis Green Goblin to the rat in Wes Anderson's "Fantastic Mr. Fox." But Dafoe says he doesn't think he is always cast as a villain. "I think that is people's perception because the more widely seen movies, the more studio movies tend to function more in the dark way, as an antagonist. But if I look at my filmography, probably I play more heroes than bad guys," Dafoe said. In "A Woman," it's not always clear who's the good guy and who's the bad guy. Max is in New York City promoting his new book when he falls in love with Julie, played by Jess Weixler, whose acting credits include appearances in the TV series "Medium" and "Law&Order" as well as films including "Teeth." It's only when Julie accompanies Max to Italy, where he is working on a novel, that the mystery emerges. The Italian sequences are filmed under strong light, reflected in the beach where Julie sunbathes beneath a vertigo-inducing black-and-white swirling hat, and in the sprawling bleached stone villa where Max writes. Julie can't seem to escape the presence of Max's dead wife, Lucia Giordano, a beautiful tango dancer. "I think all along in the story, lots of little possibilities are dropped. Some are developed, some are not," Dafoe said. "Giada, as she tells the story, makes room for the audience to join Julie's paranoia." Dafoe said his Max "is very guarded. ... He's carrying a secret." Colagrande said she was inspired by American noir films of the 1940s, where the plot functioned on a more subconscious and less overt level. She took inspiration from Hitchcock's "Rebecca" and "Notorious" as well as from the work of David Lynch and video artist Bill Viola. "Noir is my favorite genre in films. ... That is always a source of inspiration and a reference for anything I write or I direct or have made so far," said Colagrande, 35. "In this case, the element I was attracted to from noir as well and other sources was the use of light and of the shade and the composition." The contrast of dark and light is a key element of the film. New York represents a positive sort of mystery that turns foreboding under Puglia's strong light. "The white part was more the properly scary part, the kind of negative mystery that drives to madness," she said. In the same way, the sun and sea, usually beckoning fun and relief, play against character. "The sun and the sea were basically the devils of our tale. It is really about a sense of belonging to those elements in a scary way," Colagrande said. Dafoe and Colagrande, who married in 2005, said they will continue their professional collaboration but Colagrande didn't want to say what that those plans might be. "I am superstitious and I can't talk about them," she said. "A Woman" will screen in the Pusan Film Festival next month in South Korea. For the moment, the couple are working on finding the right distribution. Dafoe is also looking forward to the release of another project, "John Carter of Mars," a return to animation with Andrew Stanton of Disney's Pixar Animation Studios. Dafoe previously worked with Stanton on "Finding Nemo," playing Gill, the wizened aquarium fish who helps Nemo to freedom. In "John Carter of Mars," based on an Edgar Rice Burroughs graphic novel, Dafoe plays a 9-foot-tall Martian warrior. "I think it is going to be an important movie. It's very big, it has lots of special effects, live action mixed with special effects," Dafoe said.